Home Nigerian News Biafra: Orji Uzor Kalu meets Nnamdi Kanu, to Hold Talks With Nigerian Government. Biafra: Orji Uzor Kalu meets Nnamdi Kanu, to Hold Talks With Nigerian Government. 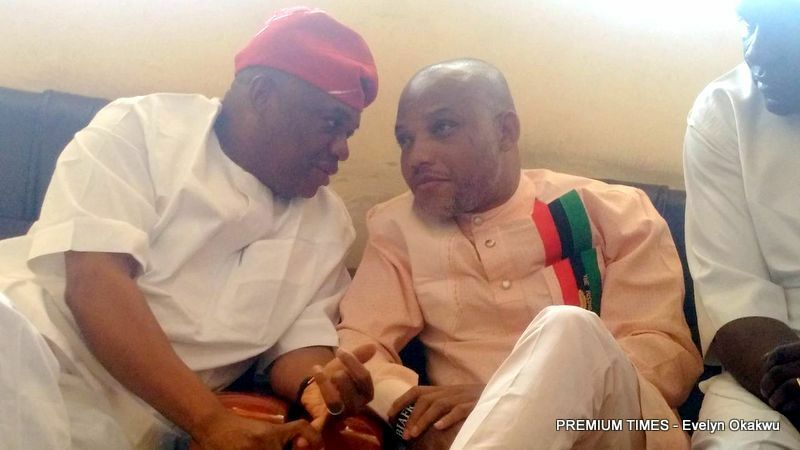 Former Abia state governor, Orji Uzor Kalu, on Friday met the detained leader of the Indigenous People of Biafra, Nnamdi Kanu, in an effort to broker a political solution to his trial for alleged treason. Mr. Kanu was arrested by the operatives of the State Security Service on October 14 and was charged alongside three others, David Nwawuisi, Benjamin Madubugwu and Chidiebere Onwudiwe, with treasonable felony. After the meeting, Mr. Kalu, who defected recently to the ruling All Progressives Congress, told journalists in Abuja that the detainees had given him the “go-ahead to talk on their behalf” with the Federal Government. The former governor was optimistic that supporters of Mr. Kanu would now be more cooperative with the authorities, following his discussion with their leader. He said the discussion will form the basis for an interface between the Federal Government and Mr. Kanu. He added that the planned talk would have the view to end Mr. Kanu’s trial. “I came to talk to him to talk to his supporters. I think they will have a change of attitude. We are all Nigerians. If both himself and the Federal Government are genuinely interested, we can come to a common ground. It is a possibility,” said Mr. Kanu. On the decision of the Federal High Court hearing the case against Mr. Kanu and his colleagues to grant partial protection to prosecution witnesses, Mr. Kalu said the practice has long existed. “The protection of witnesses is nothing new in law. We can do that but it may not get to that stage; if we talk to each other well. It is possible to settle out of court if both parties are realistic. “Now he has given me the go-ahead to talk on his behalf. And if I can speak on his behalf, then the process will begin; and if things go as they ought to, we might not get to the stage of having to require protection of witnesses. “If he trusts me and the Federal Government trusts me, I don’t see how this will not work. I know the government well. I am a member of the ruling party. So I can use my position well,” Mr. Kalu said. The former governor explained that his visit was in line with the United Nations’ charter on human rights and in furtherance of his duty to the state he once governed. “My visit to Kanu is in compliance with the United Nation’s charter that, anyone who is in prison should frequently be visited. “I decided to come and visit him as a younger brother and as a former governor of Abia State; once you become a governor, you have a duty to always protect your people. Mr. Kanu and the three other members of IPOB are being tried at the Abuja Division of the Federal High Court. The court had on December 17, 2015 ordered the SSS to release Mr. Kanu unconditionally. But that ruling, delivered by Justice Adeniyi Ademola who is being accused of fraud and is currently being prosecuted, was upturned by another judge, John Tsoho, in January. Shortly after the ruling refusing him bail, Mr. Kanu declared no confidence in Mr. Tsoho’s impartiality, forcing the judge to withdraw from the matter. Subsequently, the case was transferred to another judge, Binta Nyako. Mrs. Nyako also refused the same bail application for the defendant on December 1. In recent weeks, Mr. Kanu’s court appearance had been occasioned by commotion caused by his supporters at the court premises. During the last sitting on December 13, Mr. Kanu’s supporters clashed with prison officials after he made some remarks against President Muhammadu Buhari. Mr. Kanu hails from Umuahia North Local Government Area of Abia state.